"The Man on the Flying Trapeze" and Burl Ives had a meeting and came out of it with quite a tale ! Ives, the lovable grandfatherly singer known for Americana movies and music, loved folk tunes and he loved laughter. 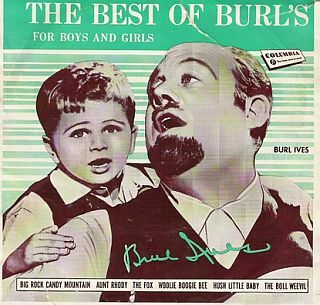 The following words to "The Man on the Flying Trapeze" were taken from a tape by Burl Ives called THE BEST OF BURL'S FOR BOYS AND GIRLS. Some of the words may vary from the original version, and I don't recall as many verses when I heard my great uncle Joseph sing this classic song. At any rate, enjoy his version of the tale of this girl-snatching stuntman! To me, was an awful disgrace. Like an old coat that is tattered and torn. And my love he has taken away. Then he did somersaults, three in a row. When he winked at her from up above. To the ground on his flying trapeze - OOH!! With him who had stole her away. And sat her upon the trapeze--- OOOOHHH!! But my love, but my love, but my love - he has stolen away!!" See English folk music and the Popeye cartoon video for more great memories about this classic Americana circus song!